At the Leipzig Book Fair. Which, as you can see, isn’t just any book fair. 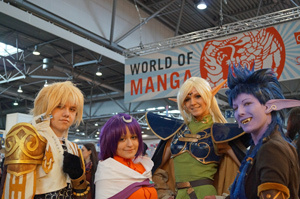 As well as celebrating traditional books, this is the biggest Manga Comic Con in Europe. And as practically every teen I know who reads LOVES Manga, it’s definitely the place to be. There will be drawing. There will be girls in blue wigs, and face paint, and wings, and space outfits, and boys in the same. There will be lots and lots of books. There will be my lovely publishers, Chicken House Germany, who kindly invited me, and me, reading from You Don’t Know Me, and thinking how much my characters would have loved to be there. This entry was posted in Writing and tagged book fair, Germany, Leipzig, manga, Tour, Writing by sophiabennett. Bookmark the permalink.